A River Runs Through It is a 1992 American period coming-of-age drama film directed by Robert Redford and starring Craig Sheffer, Brad Pitt, Tom Skerritt, Brenda Blethyn, and Emily Lloyd. It is a based on the 1976 semi-autobiographical novel A River Runs Through It by Norman Maclean, adapted for the screen by Richard Friedenberg. Set in and around Missoula, Montana, the story follows two sons of a Presbyterian minister, one studious and the other rebellious, as they grow up and come of age in the Rocky Mountain region during a span of time from roughly World War I to the early days of the Great Depression, including part of the Prohibition era. The film won an Academy Award for Best Cinematography in 1993 and was nominated for two other Oscars, for Best Music, Original Score and Best Adapted Screenplay. The film grossed $43 million in US domestic returns. The Maclean brothers, Norman and Paul, grow up in Missoula, Montana with their father, Presbyterian minister John, from whom they learn a love of fly fishing for trout in the Blackfoot River. They learn to cast using a ticking metronome. The boys become accomplished fishermen as a result. Norman and Paul are home taught and must adhere to the strict moral and educational code of their father. As they grow older, it becomes clear that Norman is more disciplined and studious, while Paul is fun-loving, wild, and the more talented fisherman. Norman attends a July 4th dance with his friends after returning home from six years away at Dartmouth, where he meets Jessie Burns. Paul has become a reporter at a newspaper in Helena. He has angered many of the locals by falling behind in a big poker game in Lolo Montana where a bar is a front for gambling and prostitution. He is also dating an Indian woman, Mabel, who is deemed inferior by the community. Paul is arrested after fighting a man who has insulted her, and Norman is awakened in the middle of the night by a phone call from the police to come and bail Paul out of jail. After Norman and Jessie go on several dates, she asks that Norman make an effort to get along with her brother Neal, who is visiting from California. Norman and Paul do not like Neal, but at Jessie's insistence they invite him to go fishing. Neal shows up drunk with Rawhide, a woman he met at a bar the night before. Norman and Paul decide to fish anyway and return to their car hours later to find that Neal and the woman have drunk all the beer and passed out naked in the sun. Norman returns a painfully sunburned Neal home, where Jessie is waiting for them. She is angry that the brothers did not fish with Neal. Norman asks Jessie to drive him home, as he had brought Neal back in Neal's car, and he tells her that he is falling for her. She drives away angry but a week later asks Norman to come to the train station to see Neal off. After the train departs, Norman shows Jessie a letter from the University of Chicago: a job offer for an English Literature teaching position. Norman asks Jessie to marry him. When Norman tells Paul about the job offer and marriage proposal, he urges Paul to come with him and Jessie to Chicago. Paul says that he will never leave Montana. Just before leaving for Chicago, Norman, Paul, and their father go fly fishing one last time. Paul catches a huge rainbow trout that drags him down the river through a set of rapids before he finally lands it. John proudly tells him what a wonderful fisherman he has become, and how he is an artist in the craft, much to Paul's delight. They pose for pictures with the huge fish. Soon after the fishing excursion, Norman is called by the police, who tell him that Paul has been found beaten to death in an alley. Norman goes home and tells his parents the news. Years later, Mrs. Maclean, Norman, Jessie, and their two children listen to a sermon being given by John, who dies soon after. Of course now I'm too old to be much of a fisherman, and now I usually fish the big waters alone, although some friends think I shouldn't. But when I'm alone in the half light of the canyon, all existence seems to fade to a being with my soul and memories, and the sounds of the big blackfoot river, and the four-count rhythm, and the hope that a fish will rise. Eventually all things merge into one, and the river runs through it. The river was cut by the world's great flood, and runs over rocks from the basement of time. On some of the rocks are timeless raindrops; under the rocks are the words, and some of the words are theirs. I am haunted by waters. The Redeemer Lutheran Church in Livingston, Montana, used for the Presbyterian church scenes. Although both the book and movie are set in Missoula and on the Blackfoot River, it was filmed in late June, early July 1991 in south central Montana in Livingston and Bozeman, and on the nearby upper Yellowstone, Gallatin, and Boulder Rivers. The waterfall shown is Granite Falls in Wyoming. Filming was completed in early September 1991. An article published in the Helena Independent Record in July 2000, based on recollections of people who knew both brothers, noted a number of specifics about the Macleans — notably various chronological and educational details about Paul Maclean's adult life — that differ somewhat from their portrayal in the film and novella. Mark Isham, who would go on to compose the scores to most Robert Redford-directed films, composed the musical score for the film. Originally, Elmer Bernstein was hired to score the film. However, after Redford and Bernstein disagreed over the tone of the music, Bernstein was replaced by Isham. Rushed for time, Isham completed the score within four weeks at Schnee Studio of Signet Sound Studios in Hollywood, CA. Upon release, the music was met with positive reviews earning the film both nominations for Grammy and Academy awards. The A River Runs Through It (Original Motion Picture Soundtrack) was released on October 27, 1992. In some home video releases of the film, Elmer Bernstein is credited as the film's composer despite his score being rejected during post-production. It premiered at Bozeman, Montana with a theatrical release on October 9 in the United States. 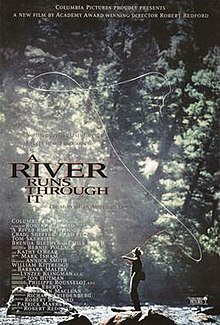 A River Runs Through It was originally released on VHS on May 19, 1993, where a new version of the Columbia Tristar Home video logo was played for the first time. It was re-released for the first time on DVD in 1999 and a Deluxe Edition issued in 2005, with very little bonus material. It was reissued on Blu-ray in July 2009 by Sony Pictures with six extra features including 17 deleted scenes and a documentary titled Deep Currents: Making 'A River Runs Through It' with interview segments of the cast and crew. Released on October 9, 1992, the film grossed $43,440,294 in US domestic returns. The film holds an 80% rating on Rotten Tomatoes based on 45 polled critical reviews. The site's consensus reads: "Tasteful to a fault, this period drama combines a talented cast (including a young Brad Pitt) with some stately, beautifully filmed work from director Robert Redford." Much of the praise focused on Pitt's portrayal of Paul, which has been cited as his career-making performance. The film was nominated for three Academy Awards in 1993, including Best Cinematography (Philippe Rousselot); Best Music, Original Score (Mark Isham); and Best Writing, Screenplay Based on Material from Another Medium (Richard Friedenberg). Rousselot won for Best Cinematography. At the Golden Globes, Robert Redford was nominated for Best Director - Motion Picture, but did not win. ^ "AFI-Catalog". catalog.afi.com. Retrieved 16 March 2019. ^ a b c "A River Runs Through It (1992)". Box Office Mojo. Retrieved March 9, 2015. ^ a b Thompson, Toby (October 11, 1992). "A River Runs Through It". Washington Post. Retrieved April 28, 2013. ^ "A river runs through it". Youtube.com. Retrieved March 17, 2019. ^ McMillion, Scott (June 20, 2003). "Writers, professors read A River Runs Through It". Bozeman Daily Chronicle. Retrieved March 9, 2015. ^ Kidston, Martin J. (July 9, 2000). "Paul MacLean in Helena". Independent Record. Helena, Montana. Retrieved March 9, 2015. ^ "Filmtracks:A River Runs Through It (Mark Isham)". Filmtracks.com. Retrieved September 6, 2012. ^ Mark Morton. "A River Runs Through It [Original Motion Picture Soundtrack]". AllMusic. Retrieved September 6, 2012. ^ "A River Runs Through It". Rotten Tomatoes. Retrieved March 9, 2015. ^ Turan, Kenneth. "Reverence Runs Deep in 'River'". Los Angeles Times. Retrieved September 30, 2012.